Lee Pfluger, a San Angelo philanthropist and businessman, developed the idea of Concho Christmas in 1995. After finding support from community leaders in October of that same year, a committee of interested San Angeloans created a walking tour in the El Paseo de Santa Angela area featuring several lighted scenes and 21 sponsor Christmas cards. Then, in 1996, Concho Christmas found a new and permanent home along River Drive which allowed for its evolution from a walking to a driving tour. In 1997, the first opening ceremony was held at the Bill Aylor Sr. Memorial River Stage and featured the San Angelo Community Band as well as student choirs from the San Angelo Independent School District. Concho Christmas now displayed 7 major and 12 minor lighted scenes, 24 lighted angels, 46 lighted decorations, 36 sponsor Christmas cards and over two million lights in the Tour of Lights. 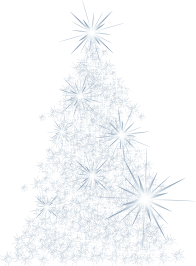 In 1998, Christmas music, broadcast through a community FM radio station, enhanced the experience of those driving through. Although new lighted scene pieces were added every year, one of Concho Christmas' most dramatic attractions was completed in December 2001 - "The Tunnel of Lights"- and was placed adjacent to the Beauregard Bridge. Hirschfeld Steel designed and fabricated the first 100 feet of the tunnel in San Angelo. (They would add an additional 100 feet in December 2002.) Businesses and volunteer groups were now actively engaged in Concho Christmas. Dubbed "Community Hosts" these groups served as greeters, passing out candy canes and collecting donations from guests for each of the 31 nights in December. Also in 2001, the "Lights of Christmas Parade" celebrated its first year. 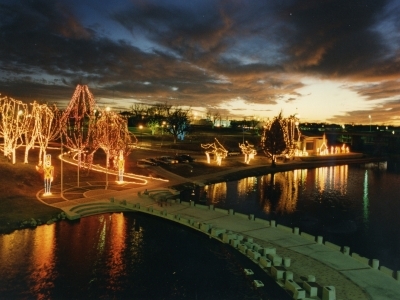 The Community Tree Lighting Ceremony was moved from the River Stage to the corner of Chadbourne and Concho Avenues in 2004 to coincide with the Lights of Christmas Parade. By 2006, "The Twelve Days of Christmas" was declared complete with the purchases of "Two Turtle Doves," "Three French Hens," "Nine Ladies Dancing," "Eight Maids A Milking" and the "Twelve Drummers." Also in 2006, Concho Christmas joined forces with the San Angelo Road Lizards to offer a non-competitive run through the light display. This event quickly gained popularity and took the name "Run Rudolph Run." Another partnership flourished in 2007 as First Christian Church offered to present a live nativity scene during the three weekends before Christmas, in 2007. During this same year, Concho Christmas' low power radio station (KCSA 95.7 FM - now KCSA 97.1 FM) that had been airing holiday songs, expanded into year-round programming, broadcasting music of the 1950's as well as community concerts such as those presented by the San Angelo Symphony, and the Angelo State University Chorus. Today, the Tour of Lights has grown into a 2.5 mile drive with the banks of the Concho River lit by over 3 million lights. Concho Christmas has evolved its programming from a small static light display, to consist of a live nativity, Community Tree Lighting, Christmas parade, fun run, radio broadcast and an extraordinary light show.